From Left: Chris Detheridge with Senior Partner Jeremy Taylor, Managing Director Diana Packwood and Employment Director Keir Hirst. A Shropshire solicitor who specialises in litigation work has just been promoted to the position of director at a leading county law firm. 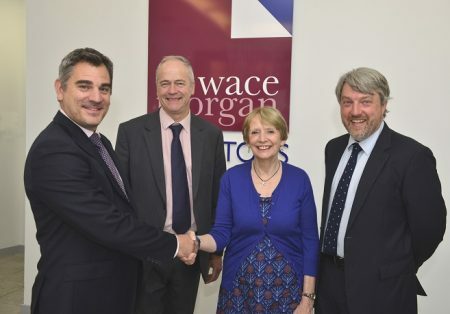 Chris Detheridge, litigation partner at Wace Morgan Solicitors, steps up to the position of director with the firm, which has offices in Shrewsbury and Newtown and employs around 90 people. A member of the Professional Negligence Lawyers Association and a qualified mediator, Chris has more than two decades’ experience in the law, joining Wace Morgan eight years ago. “I am delighted to be made a director at such a well respected law firm – this is a great honour for me as Wace Morgan is such a well-recognised name in the county and beyond,” said Chris, who specialises in contractual disagreements, including disputes between partners and shareholders, professional negligence and probate issues. He originally attended law school in Chester after graduating from Cardiff University and is an accredited civil and commercial mediator after completing extensive training.